She captivated millions around the world after winning the first runner-up title at the Miss Universe Pageant in 1999. Soon after her win, she started her TV career as an anchor host for, “Unang Hirit”, a local morning show in the Philippines. She is recognized as a multi-awarded host, a nominated actress, a celebrity endorser for top consumer brands and a celebrity ambassador for Worldvision Development Foundation. She is an entrepreneur and currently one of the anchor hosts at The 700Club Asia, a Christian inspirational news magazine show. She is carving a niche for herself as a sought-after inspirational speaker. In 2017, she was awarded as one of the 25 Most Inspiring Filipinas of BAYO. Her first book “HE CAN CATCH YOU WHEN YOU FALL, The Continuing Life Story of MIRIAM QUIAMBAO” as is a Philippine best-seller. She aims to use her story, talents and resources for God’s greater glory. 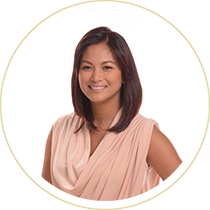 A loving wife to best-selling author, inspirational speaker and award-winning entrepreneur Ardy Roberto, and a mother to ten year-old, Joshua. Get ready to be inspired, engaged and empowered!